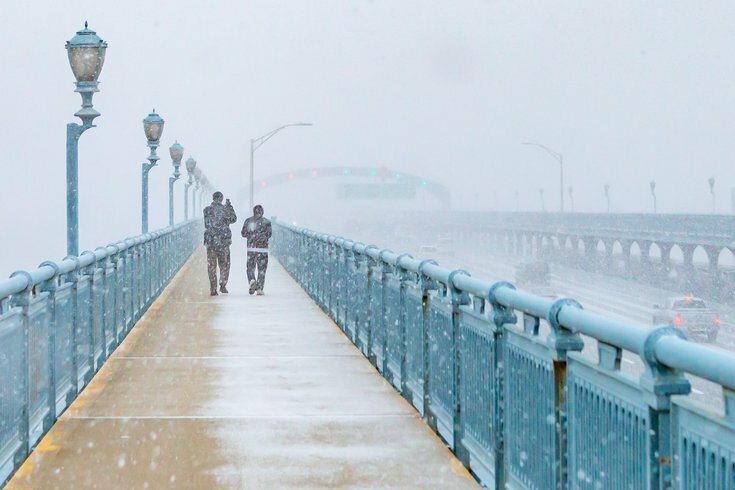 People walk across the Benjamin Franklin Bridge during a snow squall that brought a quick burst of heavy winds and snow to the region, Wednesday, Jan. 30, 2019. A deadly polar vortex is sweeping across North America this week. And we'll say it again: It's cold. Temperatures fell to negative 22 degrees in Chicago (colder than parts of Antarctica, by the way) and officials are warning anyone outside for too long about the dangers of frostnip, hypothermia, and frostbite. On Thursday morning, areas of the Midwest were experiencing record-lows around minus 77 degrees, according to Accuweather. We gathered some visuals to show just how cold a polar vortex is when it's negative 77 degrees. Everyone is throwing boiling water into the air to watch it freeze. Not Siberia, its Chicago today.. Friend of mine sent me this from Chicago, in Midwest USA, temperature dropped to -18 f (-25 Centigrade) Windchill -50 f.
Chicago was colder than the South Pole this week. And Philly is feeling it, too. The National Weather Service in Mount Holly, New Jersey is predicting the low on Thursday night to drop to 9 degrees. The wind chill on Thursday afternoon makes it feel like negative 3 degrees. And the region has a 50 percent chance of snow on Friday, too. With inclement weather today, use caution during your SEPTA travels as platforms, parking lots and vehicles may be slippery. It's hard to decide what to do when it's that cold. So, probably nothing. Be safe and stay warm.